Regular visitors to elobeatlesforever (elobf) over the last decade will (hopefully) recall that the withdrawn US promo 10" picture disc of ELO/Olivia Newton-John's 1980 hit "Xanadu" (MC10384) has been featured by elobf on a number of occasions due to its rarity and value, having been sold on eBay at least five times for the best part of $10,000 and it being ranked by Record Collector Magazine as their #1 scarcest, rarest and most valuable picture disc back in April 2015. 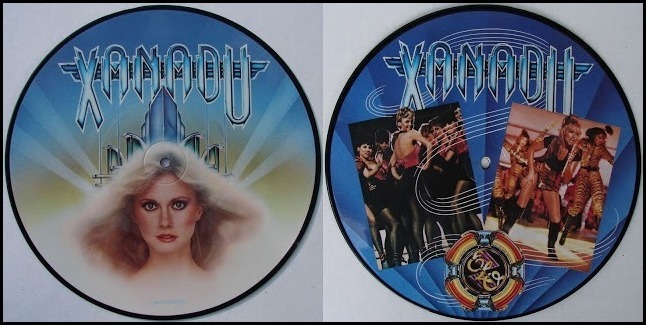 Yours Truly KJS is also a record collector as well as being an avid ELO (and related artistes) fan so when I came across another "Xanadu" related picture disc taken from the ONJ side of the "Xanadu" original soundtrack album (JETLX526), I took the plunge and bought it. "Magic" b/w "Whenever You're Away From Me" (JETP196) by Olivia Newton-John peaked at #32 in the UK Official Singles Chart more or less at the same time that ELO's "All Over The World" (JET195) was just falling short of the Top Ten at #11 during August 1980. It's a nice item with both sides of the disc sporting a rather glamorous image of ONJ but it does beg one question. If the story is true that the reason that the aforementioned "Xanadu" picture disc was pulled (with just a handful of copies escaping the cull) because Olivia was unhappy with the image on it, then should one presume that she was consulted over and/or happy with those used for the "Magic" picture disc? I guess we'll never know but it's still an interesting line of thought for both ELO and Olivia Newton-John admirers. I have the 10 inch pink one but like you Keith never seen this one in my life. Although I was overjoyed at seeing ELO at No 1 in the UK for the fist and sadly only time, I do think they could have made a bit more of the single. At the time if they had sold the single in 10 vinyl colours I would have most likely bought them all!! I am sure that it's stay at No1 might have been longer with better commercial practices.